I never counted how many restaurants there are in Chania but I guess that if you included all eating places, from souvlaki joints via tavernas, ouzeria, fancier restaurants and workers cafés in the covered market you might well get into three figures….That’s a lot of restaurants for a town of just over 50.000 inhabitants (or 85.000 if you count in the greater Chania from Souda to Nea Kydonia and all the way South to the mountains). It’s also a lot of good restaurants: consider that many of those stay open all year around and don’t just target the tourist market. If they are going to survive with such an intense competition (and in a deep recession) they will have to be good. I am going to make a short list of good restaurants for another page on this web site and thought that it might be a good idea to try to get recommendations from other visitors to Chania. I could do this via Facebook but I would prefer to use the comments section of this blog for this purpose. So please, let me know what your favourite eating places are in Chania and why. And feel free to comment on the choices of others. I’ll add your favourite places to the list in the article as things happen and eventually will publish some of the better recommendations on a page about where to eat in Chania. Please try to keep your recommendations to Chania, at least for now. I’ll start with 3 of my favourites (note that I am not saying that they are my 3 favourites, I have no ranked favourite place). I don’t go to eat at Chrisostomos very often because I am often in Sfakia (where you can eat good Sfakian food in a lot of places) so I don’t feel that much need for good Sfakian food when eating out in Chania but it is probably the restaurant that I recommend most often to people who are staying in Chania and want to experience true, high quality, traditional Cretan food. Chrisostomos comes from the village of Anopolis (he also owns the beach café at Marmara near Loutro) and has a passion for quality and great pride in his work. His restaurant is really popular with locals so if you are going to go late in the evening (when most Greeks go out to eat) it is a good idea to reserve a table. This year the restaurant is also open in summer (most years it was only open from November to April when Chrisostomos wasn’t running the Marmara kantina) so it might be your first chance to go and try it if you only come in the tourist season. in the 1980s, before I lived in Crete, Tsalikis used to be one of my favourite places. One reason was because a good friend on mine lived at Chryssi Akti and we could go to Tsalikis by just walking along the beach towards Chania. The second reason was the beautiful location of Tsalikis with a terrace shaded by tamarisk trees right over a narrow strip of the Chania town beach. You could also watch the sunset from there and the food was very good. Once I lived in Crete I rarely came to Tsalikis because it was the wrong end of town for me. But a couple of years ago I went back and loved it again just as I had over 20 years ago. It seems that Tsalikis has gone down in popularity, at least the last few times I ate there it was very quiet, almost deserted, but the food is still very nice (mainly fish but also a good choice of other foods) and the settings are still superb. I’d avoid it on a very windy day though because you might need to eat inside and would miss out of the lovely beach side setting. Located on the main road of Halepa (near the church of Evangelistri) this busy grill place is far from the usual tourist places. You won’t go there for the views (it’s located on a busy road) or the charm of the interior (although it is perfectly OK) but if you are after any type of grilled meat it’s one of the best (and best value) places to go to. A favourite with students (the university is not too far up the road) and locals. They also do take-aways and will deliver. And now it’s your turn! Please let us know about your favourite eating places in Chania in the Comments section. Me and my friends like to Chania tavern “To Doloma” (Kapsokalyvon 5, Neoria) and Akrogiali Tavern (Akti Papanikoli 19). Don’t bother going to the Akrogiali! Just stick with the wholly excellent “To Doloma”: superb genuine Greek cooking at very reasonable prices and a splendid ambience just behind the Arsenals. The Tamam, Zambeliou 49, Chania. First ate at this restaurant over twenty years ago when I lived on Crete. Made regular trips to Chania over this period to here eat and was never disappointed by the tasty and authentic Cretan cuisine and chilled unique Historic environment ( the restaurant was originally a Turkish bath!) Have returned to Crete several time since most recently last summer and the food was still wonderful and filling. Will continue to visit the Tamam as it is an all time favourite! For those in Aghia Marina you cannot beat Romeo’s as they will cook for you watever you require even if it is not on the menue. Please try to keep to Chania for now. If this works I might extend the “search” at a later stage but for now I would prefer if it was limited to Chania. “Manos” at the small habour (limanaki) in Nea Chora. You will always find fresh fish, meat and vegetables – and off course romeiko krasi. It is a nice place next to the habour and the service is 1. category. And great setting as you can sit right by the water. I love To Xani restaurant – in the old town, by the old synagogue. I’ve never had a bad meal there, the Rabbit Stifado is yummy! I agree with the previous comment about the Tamam – we too have been eating there over the last 20 years and the food is consistently good, with a lovely atmosphere. Probably our favourite in Chania. But the To Xani in Kondilaki St is also very good. We ate here too around 20 years ago – more for the music than the food, but it then closed down for some years. Now it is back and the food is really excellent. Check out the old Synagogue which is in the street behind too – beautiful and very moving. Monastiri in the old harbour in Chania is a very nice restaurant. Every time we are in Chania we go there for a meal og several meals. We have never been disapointed, the food is so good and the service is friendly and quick, as quick as it can bee, because it is always very full. You go past the old mosque and you see the restaurant shortly after. Elotia in a small sidestreet from Halidon. Vasiliko: excellent fish restaurant near the end of the harbor in the Arsenali. Irida in Kalamaki/Chanion near Panorama hotels. To Stachi,5 Defkalinos str. is a vegetarian restaurant, but you will not miss the meat. The food is tasty, and the atmosphere guestfree and cosy. Care to tell us what you mean by ‘guestfree’? Sorry, language cofusion. Hospitable was the word i needed. We like the taverna by the bridge at the far end of the new town (where the river runs out into the sea) the food there is the best we’ve tasted, always fresh, the fish cooked to perfection, good lamb as well, the best olive oil and great salads, open all year around, cosy inside in the winter but perfect outside in the summer watching sun set over the ocean, well worth the pleasant walk along the beach from town, there is also plenty of parking if needed, seem to remember it’s just called ‘Taverna Nicolas’ run by Nicolas and his wife, just try it you won’t be disapointed. I have heard other good reports about this place but have never tried it myself..
“Peinaleon”, El Venizelou Street (leading into Chanea) does great home cooked food in a cosy setting. I think it is only open out of season, though. Agree with the favourable comments about “Tamam”. “Mathios” in the far end of the harbour (to right of lighthouse) is good for fish and people-watching. “Roumeli” in Dikastiria Sq is good for grills, but the TVs don’t make for much of an atmosphere. “Karnayio” in the old harbour is not bad but I think standards have slipped from previous years when used to be better. I love the fish tavernas in the Tabakaria/Agia Kyriaki area, below Halepa. Namely “Thalassino Ageri” (amazing location and usually very good food), and “Akrolimano” (very nice, quiet location, and great seafood). They are off the beaten track, and you can combine them with a nice coastal walk from the Old Harbour to Koum Kapi and then to the coastal parts of Halepa (or the inverse). Alternatively, again for “off the beaten track” good seafood, I like “Pyrofani” in Vlites (outskirts of Chania towards Souda). “To Neorio” and “Glossitses” are also very nice fish restaurants, in a more obvious area (eastern part of the Harbour). The former is a more traditional/simple taverna, while the latter is more modern with artistic touches. And I am sure there are always very good fish tavernas in Nea Chora, though I have not been there for some time. I agree on places like “Chrysostomos”, “Tamam” and the “Well of the Turk”, for more meat-based (or vegetarian) cuisine. Tamam is a place that reminds me a bit of restaurants in northern Greece; Chrysostomos is definitely more purely Cretan. I would also add “Mesogeiakon” and “Oinopoieio” on the Daliani Street (behind Agora). The former is fairly creative (though based on traditional cooking), while the latter is a purely traditional, typical Greek restaurant, that I associate more with winter eating, for some reason (probably due to the nice warm interior). 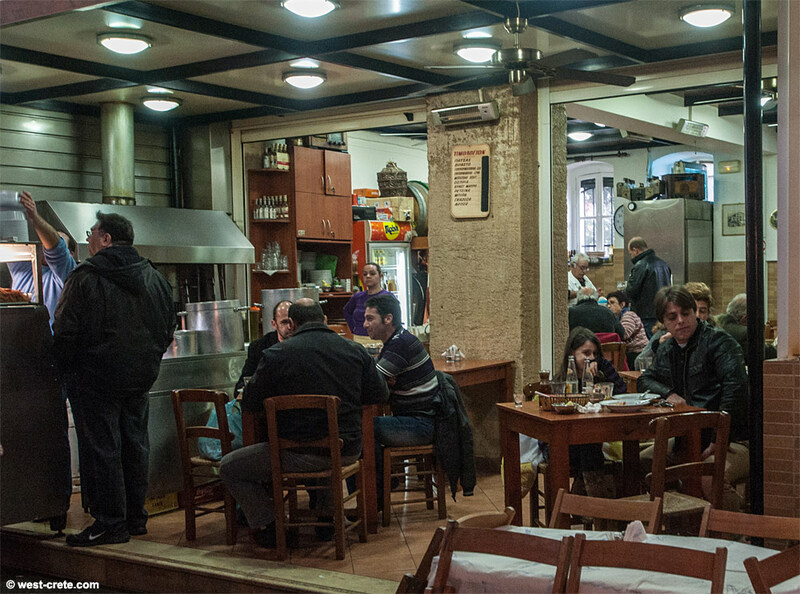 The “Mitsos” grill in Kounoupidiana is also one of my personal favourites. Simple, good food, but maybe that does not fall in the “Chania” category? Anyway, these were some quick thoughts. There are several other places that have opened in the past few years and I have not had the chance to go to. BTW: The list will become huge if we expand outside of the city..! Thanks for reminding me of ‘Ageri’ again! It used to be one of my favourite haunts when I was spending more time in Halepa. Beautiful – actually, exceptional location and great food. Very busy too. Or maybe not so busy any more in crisis times? I must go back and check it out. “Akrolimano” is nice too but I always found that there were too many mosquitoes there. They don’t normally bother me much but there they did. I notice that you are the first one to mention any of the restaurants in Chatzimichali Daliani Street. I think that because it is quite a new “in” place very few tourists know about it. I also doubt that it has made its way into the guide books. Some good places there though. I’ll accept Kounoupidiana as part of Chania 😉 If all goes well I might start a thread for other areas. As you say, it would be too large a list if we listed anywhere we like. I also lived in Crete, and first ate at Tamam in the cosmopolitan old town in Chania in the mid 1980s. Since that time I have travelled back to Chania many times. Tamam has never disappointed. The top-quality and freshly prepared food has been consistently good. Highly recommended to everyone who visits Chania. We ate there the last three years on our way back home. Nice athmosphere, nice people, very relaxed, fresh fish. Its not a big dinner place (mezedopoleion) but its just the right place to end your holidays on go back to “normal life” (and if your visting their facebook page, they have also a very good muscial taste). I would like to mention a taverna in the market place but don’t know the name, I have a photo, in front you can buy fish. We always go to that place because my husband loves tripes, and they have the best. It is a family taverna, the son and dad working in it. Can I send the photo Jean? May I add that Ilektra lives with a (Chania born) food fanatic so she ought to know what she is talking about. Excellent idea, Jean: thank you. I agree about Chrysostomos. I first ate there on a January trip about 10-12 years ago, when you recommended it – I think that was the year he opened. I haven’t been able to repeat the experience until May this year, when I was so glad to find him open for the summer for the first time. Wonderful food, nice people, lovely atmosphere, and a fine view of the car park. 🙂 I was going to go back in September but with only one evening in Chania I think it may be a toss-up between Chrysostomos and Mesogiako (thanks Ilektra!). Agreed that Chrysostomos is not the sort of place you’d go to because of the view. Even though the place is really nicely done up inside the view out is not great. But if you want a view you can always go to the other place he owns in Marmara (admittedly a long way from Chania) which has a fabulous view. I am thinking of doing a survey of places with best views by the way…a post about this is coming soon. If you only have one meal in Chania go try Mesogikao…you will have plenty of Sfakian food where you are going on holiday anyway. For now I’ll put in a bid for Kareem and Manolis who run The Plateia taverna just behind the old mosque on the harbor. It’s the end taverna in the row of establishments that runs from the mosque around into the working harbor. Kareem is Syrian and brings a flash of Middle Eastern style to the menu. The food is excellent. The place is comfortable. The service is good. The prices are reasonable. This is the harbor, after all, but they do not bump their prices up just for the view. And the view is great — if you want to eat *on* the harbor, you cannot do better. Well worth checking out. OK, that’s settled then. Mesogiako looks very good. I was only half joking about the car park view. I like view-less places sometimes – it makes a change. And yes, the view from the kantina at Marmara is wonderful. I’ll look forward to your Best Views survey. Another place I used to like a lot, at lunchtime, is the fish restaurant in the Agora. It’s a few years since I’ve been there: they have (or had) had great fish soup. I would also like to add my vote for Tamam, over the years it has provided consistently good and interesting food during our brief visits in Chania. Portes (Portou Street, two streets back from the Old Harbor) had also been a place that I frequent from time to time but for unexplained reasons it failed to impress me last time I was there. I hope that it was a hiccup only as the location, its small size and the delightful owner all can contribute to a memorable meal. But my favorite eating places are all in Sfakia, but this will be covered, I hope, in the next topic. Tamam. Lamb was excellent. Moussaka was heaven. The Achilleas, at the end of the beach in Nea Chora (Akti Papanikoli), 1,5 km from the old harbour in Chania. A family driven restaurant with a VERY pleasant atmosphere, visited by many local clients. In summer, you can sit on the terrace and watch the life on the beach or enjoy the beautiful sunset. In winter you can sit inside, the restaurant is heated. Good, local food at reasonable prices. If you want to, you can come to the kitchen and choose your fish. In winter the restaurant is closed one or two days a week depending on the weather. Thank you, Jean, for saying that Khrisostomos was open. Superb meal tonight (October 3) Absolutely excellent. We just wanted to say thank you for creating this blog. My husband and i just a brilliant week in Chania and your recommendations were invaluable! Oinopoieio and Taman were our no. 1 favourites. Well of the Turk was the most beautiful evening location. Tsalikis was a brilliant for lunch followed by a nap on the Beach. It is fantastic to have people’s opinions rather than just depend in trip advisor and the like. We will be telling friends all about Chania and the excellent value delicious food! Kouzina on Daskalogiannis street. Lunch only, a locals’ favorite – happy vibe and absolutely delicious all the time! Apostolakis on Chatzimichali Daliani (looks like an old pharmacy) is one of my favourites. Atmospheric, proper taverna feel, good choice of veg, meat, snails, cheese, good wine, grappa-like raki! Thank you so much for this blog. My wife & I spent a few days in Hania this October after a break of 16 years. this blog is a great inspiration and prompted us to try places we otherwise would not have found. We ate at Tsalikis, To Stachi and Oinopoieio. Tsalikis is our favourite location, To Stachi is our favourite for food, and Oinopoieio our favourite for atmosphere. Tsalikis and To Stachi were both quiet. Oinopoieio was very busy. From memory, our favourite place 16 years ago was Tamam. We did not eat here on this visit, but it looked busy every night. Comment is about stachi restaurant in chania. You will always find plenty of vegetarian choices in most Greek restaurants. A lot of these restaurants are not relying on tourism and they will be open. But if you want to be certain find their phone numbers and phone them, especially as they might have different opening/closing days around Xmas. Difficult to say. Easter is a MAJOR family feast so many restaurants will be closed, it’s not really a day where localpeople go and eat in restaurants. It’s probably a matter of walking around and seeing what is open. Can anyone recommend good vegatarian restaurants in chania that don’t serve meat. As I am a Muslim. Thanks for all these recommendations. I love Xania but only now am I planning to spend a whole week in the centre. Looks like I shall spend most of the time eating! Àaah…. i have now been to Chania 3 times, so I’m an expert. HA. see you in May! one of my favorite places to eat is Kouzina EPE. big pots, you pick what you want, it’s amazing stuff. way better than anything on the harbor.